We all have heard about the Order of the British Empire (OBE), where the British monarchy confers awards to civilians who have contributed in the field of arts, sports, science, etc. Similarly our Wadiyars too had a Royal ‘Order of the Gandaberunda’ and Star of Mysore recalls this princely honour as 2017 marks 125 years of the institution of Order of Gandaberunda. 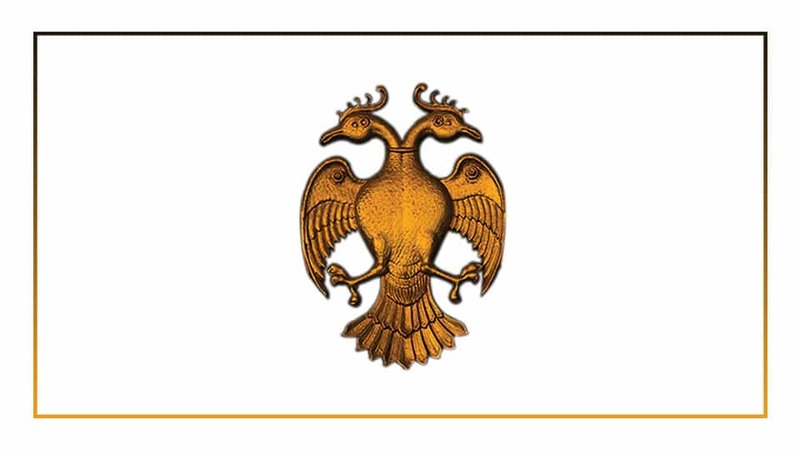 The Order of Gandaberunda was instituted by His Highness Sri Sir Chamarajendra Wadiyar, the 23rd Maharaja in 1892 to confer recognition of (1) meritorious service rendered by public servants, (2) voluntary acts of private philanthropy and (3) services rendered for the cause of learning. Between 1892 and January 26, 1950 around 304 individuals were given this Order. The ‘Palace Annual Gradation Lists’ in the State Archives mentions a few such awardees. Now the reason we recall this princely honour in this special edition of Star of Mysore is because 2017 marks 125 years of the institution of Order of Gandaberunda (Figure 1). For the record, Mummadi Krishnaraja Wadiyar officially adopted Chamarajendra Wadiyar on 18-6-1865. The British overlords ratified his adoption on 16-4-1867 and it was during the silver jubilee of the ratification of his ascension to the throne that he instituted the Order of Gandaberunda in 1892. During Krishnaraja Wadiyar the IV’s rule, these Orders and titles were conferred from the throne on the European Durbar Day held during the Dasara festivities. But from 1942 to 1949, Maharaja HH Jayachamaraja Wadiyar conferred the awards on his birthday festivities instead. But an Order or title could not be instituted without the permission and approval of the design from the Viceroy’s office. And the Order of the Gandaberunda was seen as a threat to the supremacy of the King Emperor. Earlier when HH Nalwadi Krishnaraja Wadiyar wanted to continue giving of the Gandaberunda Order, the Resident British officer wanted to know why there was any necessity at all, to which HH Maharaja Nalwadi Krishnaraja Wadiyar replied: “They are merely the continuance of the ancient custom of conferring Birudus and Mana Mariyadas (titles, decoration, souvenirs, Khillats, etc.) 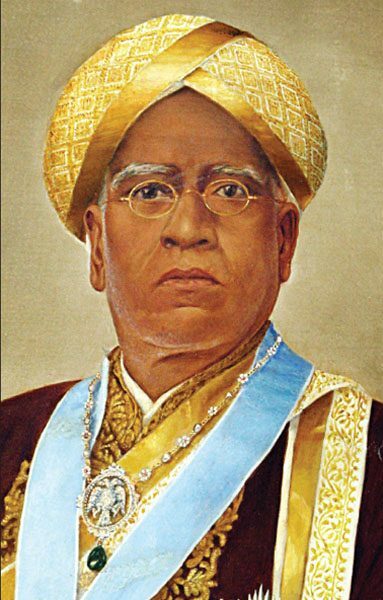 on persons who by their learning, benevolence or services to the public, the State or the Sovereign, have deserved recognition at his hands.” [Dewan of Mysore’s letter to the Resident, September 7th 1920/ Residency records of Mysore/India Office /IOLRR2/ (37/354)]. The origins of the two-headed ferocious raptor as an insignia may perhaps lie in Vedic mythology as well as in the hieroglyphic etchings found at Mohenjo-Daro and the relief sculpture found at Taxashila (Figure 3). 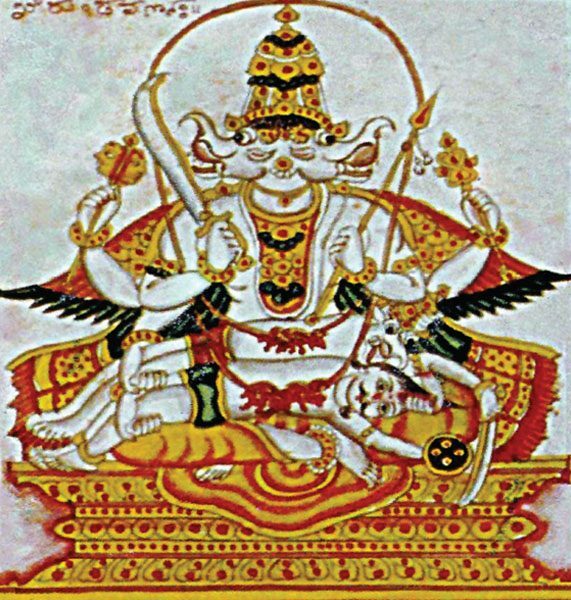 It may be of interest to know that HH Mummadi Krishnaraja Wadiyar’s magnum opus, Sri Tattvanidhi contains several references and illustrations of the mythical Gandaberunda (Figure 4). 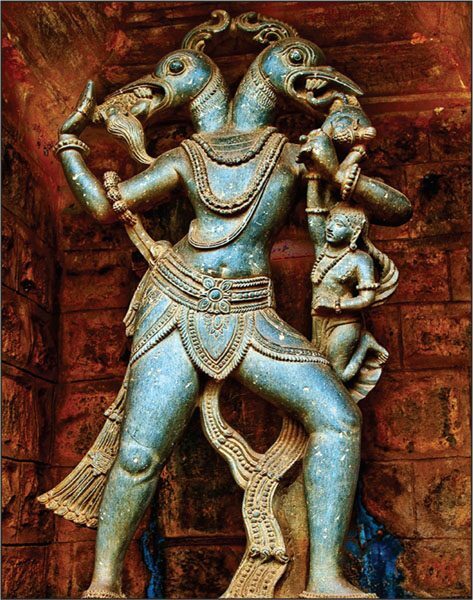 In the temple at Balligave in Shimoga district, the Gandaberunda assumes an anthropomorphic (anthropomorphism is the attribution of human traits, to non-human entities) form having a gigantic human torso complete with two arms and legs while retaining the twin avian heads. This unique sculpture is worshipped as Berundeshwara (Figure 5). Image Caption: Figure 5: Berundeshwara, Balligave. The ceiling carving of the Rameshwara temple in the town of Keladi in Shimoga District, which was the capital of the Keladi Nayakas, is an evocative depiction of the power of the mythical bird. 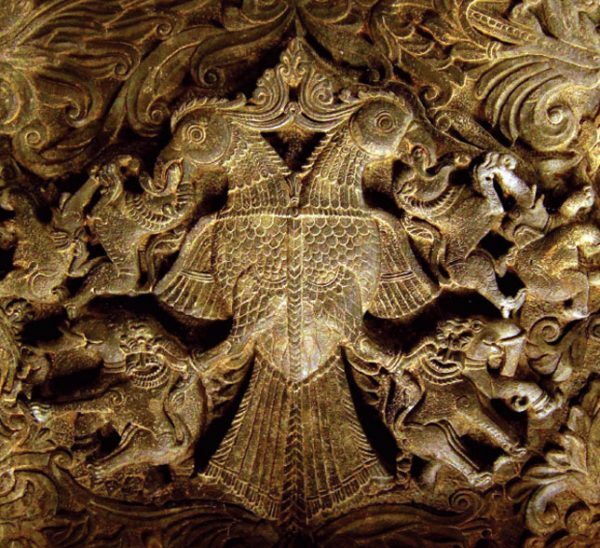 This relief carving shows a double-headed eagle (Garuda Berunda) grasping two lions in its beaks and two elephants in its talons (Figure 6). Image Caption: Figure 6: Ceiling relief, Rameshwara temple, Keladi. Who used the Gandaberunda in insignia first? 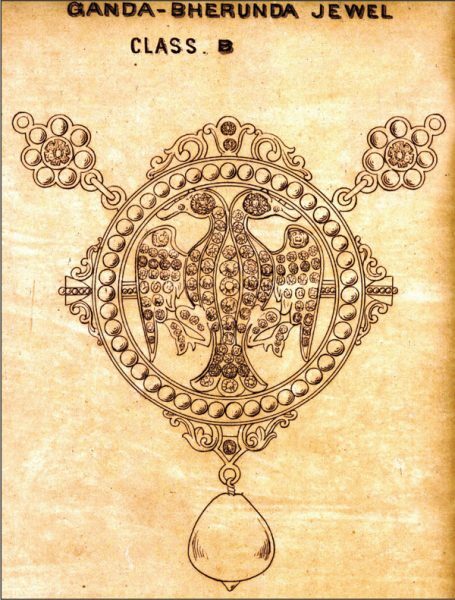 The unique form of the Gandaberunda led to kingdoms like Chalukyan, Hoysalas, Keladi Nayakas, and the Kadambas and of course the Wadiyars using the motif in crests and seals. Vijayanagar king Achyuta Deva Raya (1529–1542) was perhaps the first to use the Gandaberunda image on gold pagodas (gadyana) (Figure 7). 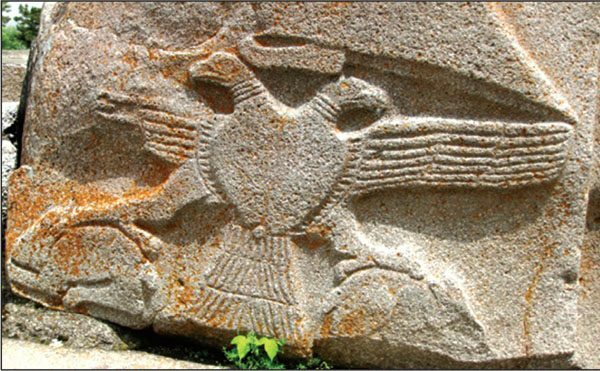 However, the earliest recorded twin-headed bird clutching two hares in its talons is found at the Hittite temple in Turkey dating back to 14th century B.C.E. (Figure 8). 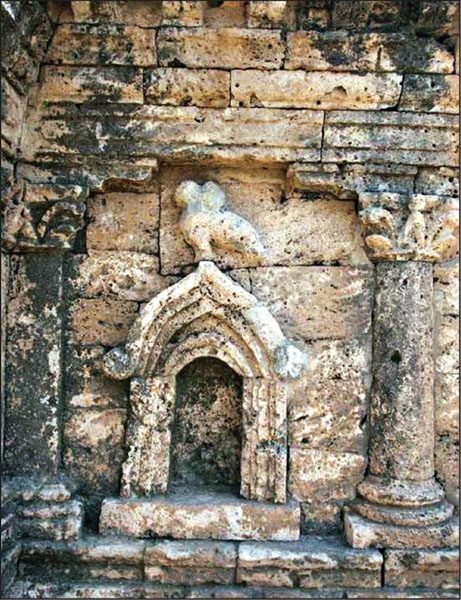 Image Caption: Figure 8: Sphinx gate, Hittite temple, Alaca Hoyuk, Turkey. The Gandaberunda honour was classified into several categories. For instance, the Order of the Gandaberunda for Meritorious Service by a public servant was a precious stone chain with a pendant (Padaka) (Residency Records of Mysore/ IO: RR/2 (37/354): Resident of Mysore to the Government of India, December 23, 1920). 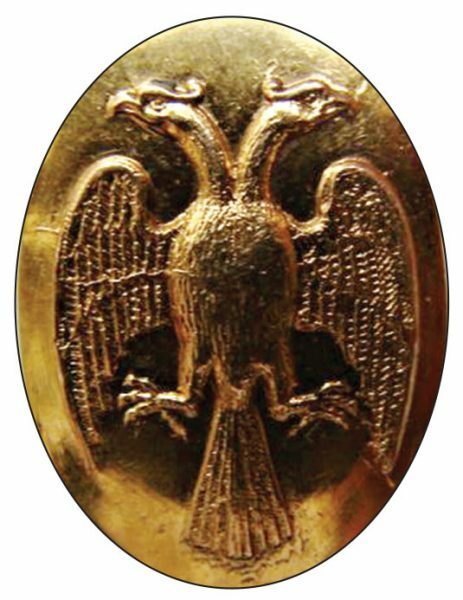 The Padaka consisted of the Royal emblem, the twin-headed bird with wings displayed, all within a wreath open at the top. From the points of which were attached to the chain to pass around the neck. The body and wings of the bird and the leaves of the wreath were composed of rubies, emeralds and sapphires interspersed with diamonds depending on the class. 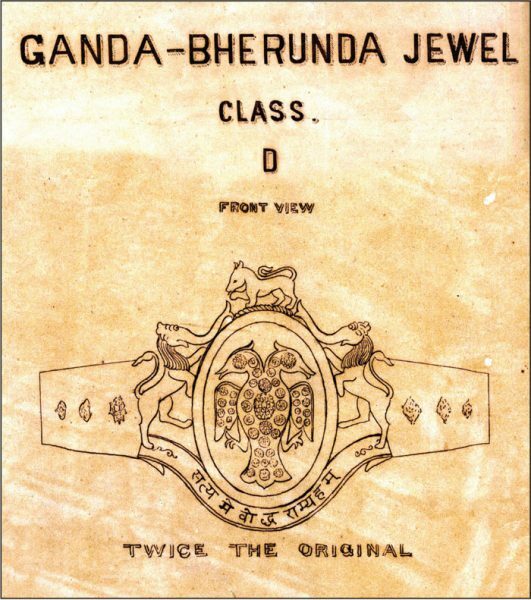 There was also another variation in design wherein the Gandaberunda was encased in a gem-studded collet. 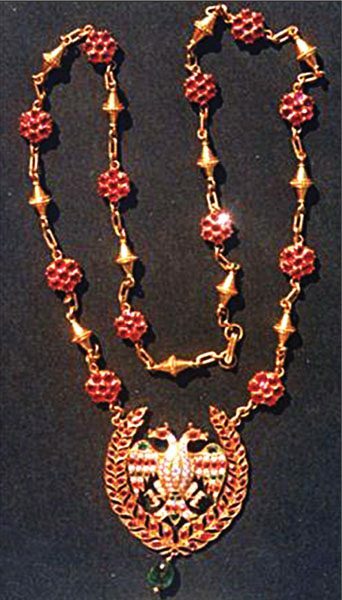 The Order was suspended around the neck by a golden chain with button-shaped flower encrusted with precious stones according to the class awarded. Image Caption: Figure 9: Original illustration of Class B. Collection: Ramsons Kala Pratishtana. By 1944, the Gandaberunda Order was reclassified: A1 reserved for Dewans and Chief Ministers, A2 for the Chief Justice, B1 (Figure 9) for Ministers and Judges of High Courts and important Sirdars, B2 for Heads of Departments, C1 for significant donations to charities, C2 for proficiency in fine arts, and D (Figure 10) for scholars and musicians. Image Caption: Figure 10: Original illustration of Class D. Collection: Ramsons Kala Pratishtana. 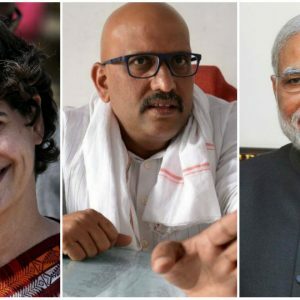 The Palace Office Annual Gradation List mentions several awardees: Rajabhushana Sirdar Mudduraj Urs, Secretary-in-Waiting to His Highness, Raja Sabha Bhushana Thumboo Chetty, Karnataka Bhasha Rathna Mahavidwan Karibasappa Sastri, Rajadharmapravina K.S. Chandrasekhar Aiyer, a retired Chief Judge, Rajakaryaprasakta Dewan Bahadur M.N. 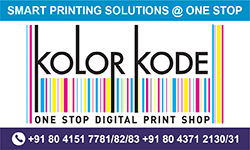 Krishna Rao, Rajamantrapravina K. Matthan I-G, Education Department, Rajamantrapravina H.V. 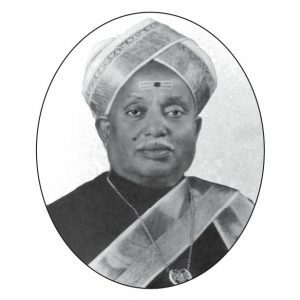 Nanjundaiya, a former Chief Judge, acting Dewan, the first Vice Chancellor of Mysore University and founder President of the Kannada Sahitya Sammelana, Rajadharmapravina Dewan Bahadur Ramachandra Iyer, Vastukalasevasakta T. Cheluvachar (Figure 11), Rajamantrapravina Dewan Bahadur Raghavendra Rao who was a tutor to HH Nalwadi Krishnaraja Wadiyar and later revenue commissioner and several others whose names have to be left out for lack of space. Image Caption: Figure 11: Collection and Courtesy: M. R. Rajaram. A variation of the Gandaberunda Order for Military service seems to have stemmed from the fact that in the Great War (1914-1919) Mysore State had attached regiments of the Imperial Service Lancers (Mysore Lancers) and the Mysore Transport Corps and it was felt that a war medal be instituted to honour men who had shown exceptional bravery. 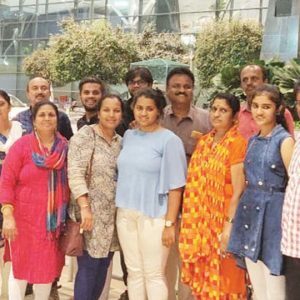 These were in four classes: First Class, Second Class, Third Class and Fourth Class and promulgated in the Mysore Durbar Orders. (From letters of Lt. Col R. E. Holland, C.I.E., Political Secretary to the Govt. of India., to H.V. Cobb, Resident at Mysore, December 1919 –Residency Records/Mysore/ IOLRR/2//36/350/Mysore War Medal). Two of the awardees of the Order of the Gandaberunda First Class for bravery in the Great War were Col. Desaraj Urs and B. Chamaraja Urs. Col. Desaraj Urs was the brother-in-law of the Maharaja HH Krishnaraja Wadiyar IV while Sirdar Bahadur B. Chamaraja Urs was the grandfather of Maharani HH Tripurasundaraamanni Avaru! Image Caption: Figure 12: Col. Desaraj Urs. Photo Courtesy: R. Raja Chandra. 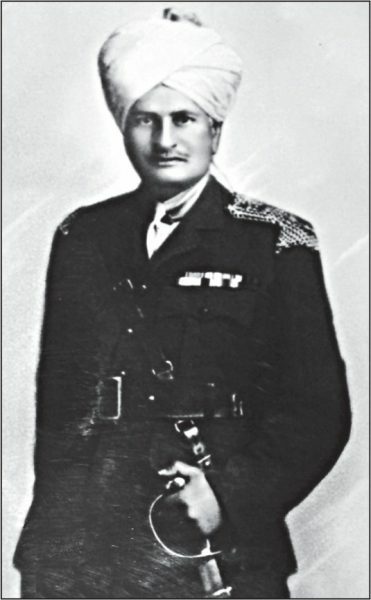 Col. Desaraj Urs (Figure 12) (attaché in Mysore Military Department) served in Egypt (October 1914-January 1916) and his name was mentioned in the despatches of General Maxwell, Commander-in-Chief of the forces in Egypt. In August 1917, in appreciation of the services rendered by him, His Highness the Maharaja, in June 1918, decorated him with a First Class medal of the Gandaberunda Order. Sirdar Bahadur Chamaraja Urs saw action in Gaza (Palestine) in November 1917. On the 7th February 1918 Brigadier-General C.R. Harbard, commanding the Imperial Service Cavalry Brigade, ‘mentioned in despatches’ the bravery of Risaldar B. Chamaraja Urs of Mysore Lancers with the recommendation that the Maharaja of Mysore be informed forthwith. The Maharaja honoured Chamaraja Urs with the First Class Medal of the Gandaberunda Order and the position of Lt. Col. in the Mysore State Forces. 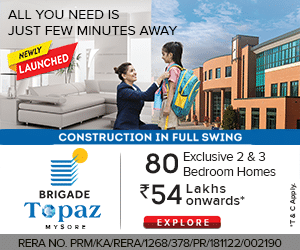 One more interesting tidbit is that among the scores of Gandaberunda insignias found in stained glass, iron fretwork, stone, stucco and even cement seen at the Chamarajendra Technical Institute (CTI), the Lalitha Mahal Palace Hotel, K.R. Hospital, Fire Brigade, and several ones in the Palace, the Police Commissioner’s Office and other places are not identical. Each seems to have its own unique variation. 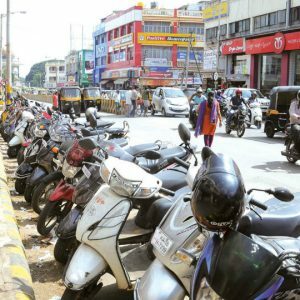 Excellent article by Mr. Singh. Well-written; rare photographs. Congratulations Mr. R.G. Singh ! As usual your articles are well researched and articulated. 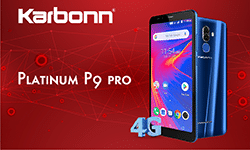 Congratulations to Mr. KBG & Vikram for reinventing the online edition and giving us an opportunity to express our opinion online. Sirdar Bahadur B. Chamaraja Urs’s war exploits in the world war-I was tinged with personal tragedy. His Son-in-law Risaldar A Lingaraj Urs was a young hero who was killed in action at Aleppo on the 26th October 1918 during the final phase of the operations in Palestine. On a previous occasion this hero did a daring feat. On the 23rd November 1915 a squadron of the Mysore Lancers operating 15 miles east of Cantarah obtained touch with a force of sixty Turks on camels, the advance guard of a raiding party 200 strong. These were pursued for seven miles, with the result that 7 were killed, twelve were captured and many others wounded. Amongst the dead was a famous Bedouin leader. 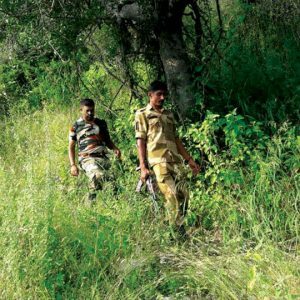 He was killed after a hand-to hand fight by Lingaraj Urs and the latter was awarded the Indian Order of Merit for this act of gallantry. 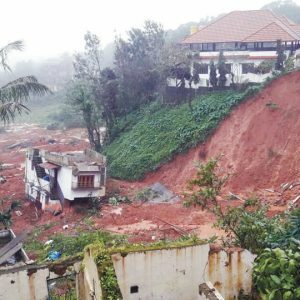 The significance of the gallant deed done by Lingaraj Urs lay in the fact that after the Bedouin leader’s death, the attempts on the Suez Canal entirely ceased. His name is immortalized in a war memorial at Bangalore ( near Door darshan) and at Teen Murti Circle at New Delhi.